Sugarfactory is a lively club in the region that has become a trending venue for art and other performances. The destination is a must visit for any traveller as it has an amazing nightlife that should not be missed out on. From soulful live music to scintillating theatre performances the place has everything that you might need to make your stay at Amsterdam a success. Walk in and you may even get to see a cabaret show. Take a bus from Amsterdam, Leidseplein. Small club that advertises itself as having 2 rooms (and a strong ethos) when it's just 1 space split in 2. I can only imagine the sound clash if something happens in the other part. There were only 1 DJ the night I was there. Very frontal sound system. You end having to face the stage (very music gig kind of stage). The dance floor is very narrow and you can practically sit on the bar - which I wouldn't describe as cheap, unlike some people seem to think. The crowd was essentially tourists who fell in the same trap. Only 2 sofas to sit along the dance floor. The only separate space to sit is the horrible smoking booth without windows. And the final touch is that they charge for the toilets!!!!!!!!!! Never again. 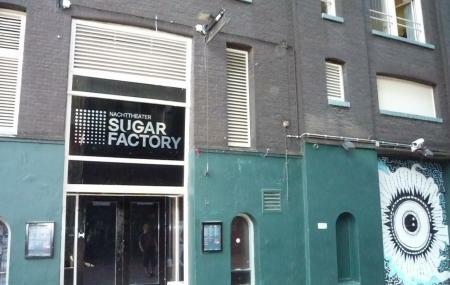 Great night on Tuesday at Sugar Factory, the place is really cool and the sound is awesome! This night was playing Anthony Castaldo, Italian dj coming from London! I really recommend this place if you're into party and techno! Wicked Jazz Sounds on Sunday was awesome! Such good vibes. Live soul singer & brass players. Small but coshure vebue friendly door staff. Good sound system! Great music venue! Highly recommend for fans of electronic/house/techno.